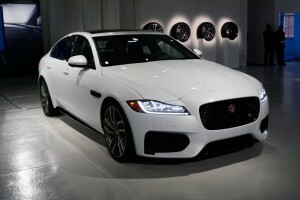 Jaguar chose to use the recent NY International Auto Show to demonstrate the 2016 Jaguar XF. The new car has plenty of notable changes, but the most important of all is the increased use of aluminum in both the body and the frame to make it more lightweight and ridged. The XF is supposed to launch at the end of the year and when it does buyers will enjoy having a vehicle that relies heavily on lightweight aluminum for its construction. While I wouldn’t call the new look of the 2016 Jaguar XF revolutionary, it is clearly improved even if those improvements are pretty subtle. Sleeker, nice lines on front, led headlamps, The car body is a bit sleeker with more pronounced lines up front to help bring out the LED headlamps a bit more. Overall it just looks a bit more like a coupe with a nice streamlined shape. Jaguar went through great lengths to improve the aerodynamics of the latest XF model. They included air vents in the front bumper of the vehicle to allow more airflow and to circulate air over the front wheels. The automaker also redesigned both the roof and bonnet of the vehicle for reduced drag. To top it all off the front end of the vehicle is more vertical than before and there’s a shorter front overhang for improved airflow overall. The improved aerodynamics should help make the vehicle more efficient, and the improved looks are nice, but what buyers should really take note of is the increasingly aluminum construction of the vehicle. All of the aluminum used throughout the body and the frame resulted in weight savings of about 265 lbs. between this model and the last. Much of the body is made of aluminum, and parts of the frame are made from a mix of aluminum and high-strength steel and magnesium alloys. Not only is the body of the vehicle significantly lighter, but it’s also 28 percent stiffer than the previous model for improved driving dynamics. One of the best things about many luxury vehicles is how quiet they are inside. Jaguar is working to improve sound deadening capabilities further and they made the XF even quieter. In order to block out more road noise Jaguar used a new analysis technique and added heat-expanding foam into the cabin. These two measures create a noticeably quieter ride in an already quiet vehicle. Like any modern Jaguar the 2016 XF comes with a slew of advanced driving features and systems. The car has electric power assisted steering that’s designed to compensate for roadway irregularities. The system helps make steering feel more fluid. The car has a traffic sign recognition system that helps make the driver aware of the current speed based on what local speed limit signs say. The system works using a small camera built into the front of the vehicle. The XF has an auto emergency braking system and comes with an adaptive dynamics system that helps the vehicle maintain good stable handling characteristics in adverse weather and other less than ideal driving situations. When the XF 2016 is released later this year it should be a noticeable improvement to last year’s model. It’s lighter, more powerful and better designed for efficiency. Not to mention that the car’s more attractive to look at making it quite the overall package.